Tuesday night, an earnest Steve Salis, owner of &Pizza, breathed new life into his moribund request for a fast food exception to open a pizza place on Barrack Row. 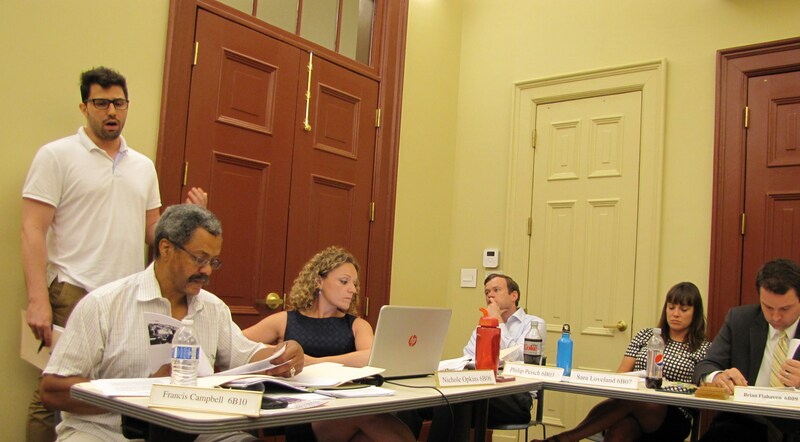 Salis appeared before ANC6B with a new proposal calculated to head off what appeared to be certain rejection of the exception. He announced that to allay the primary concerns of his 7th Street residential neighbors across the back fence, he had asked for a one month delay in consideration of his case by the Board of Zoning Adjustment (BZA). Salis said he has applied for a variance that would allow him to build an enclosure attached to the proposed restaurant for indoor trash storage, and dispose of stored trash by moving it out to 8th Street. He said he would make the application for the exception contingent on approval of the variance and that the delay would allow parties to look at his new proposed solution through an “unbiased lens”. If the delay is granted, Salis would come back before the ANC on June 10, to present the case for the variance and the request for the exception – to be considered as a package – with the request for the exception contingent on approval of the variance. Such an offer appeared to some observers to indicate Salis’ confidence that he can get BZA approval of the variance. Neighbors were having none of it. 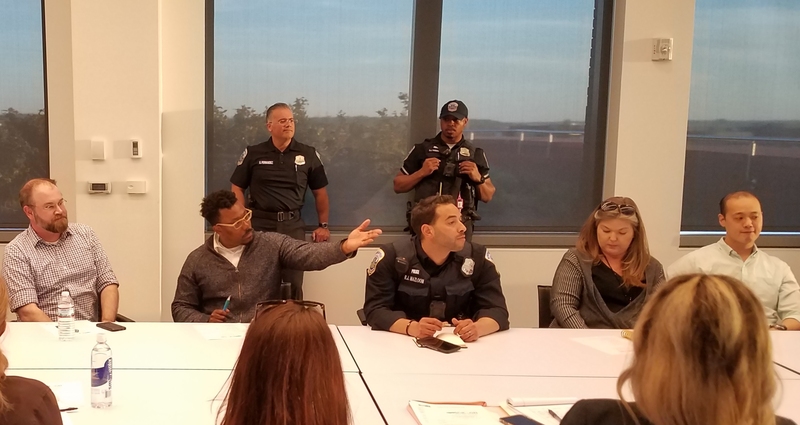 They say that the new proposal is where Salis should have started at a meeting with them in April – rather than stonewalling them then and coming in with a proposal 24 hours before Tuesday night’s meeting. 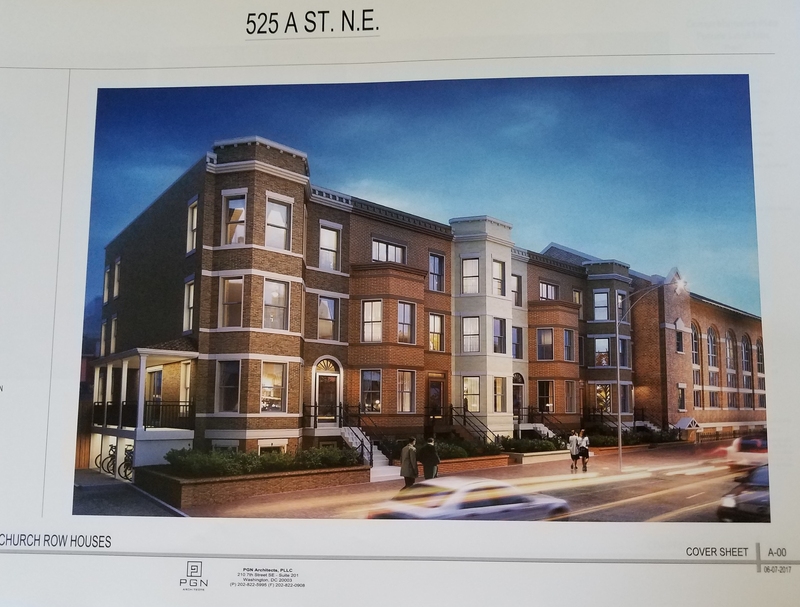 Neighbor after neighbor arose to ask ANC6B to oppose the application, citing their underlying concerns that an additional fast food restaurant on the 400 block of Barracks Row will increase the rodent, trash, noise and odor issues. For several neighbors, the trustworthiness of the applicant was at issue. 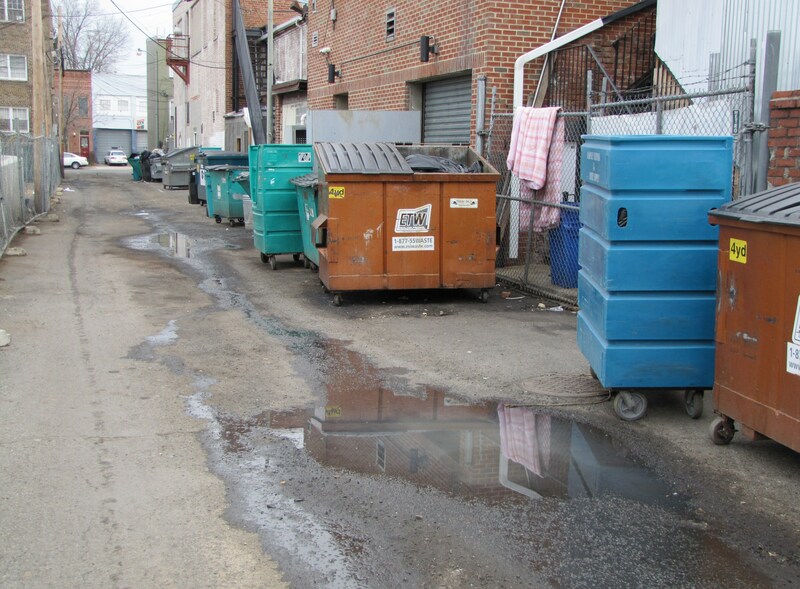 Salis allegedly told neighbors that with the exception of a couple of DPW warnings because homeless people were dumpster diving in the alley at the H Street &Pizza, he had no violations from either agency. In response to the claim, neighbors produced evidence of 23 Department of Health violations at the H Street &Pizza between May 23, 2013 and April 15, 2014. According to InspectionMapper (a website that tracks restaurants and grades them according to number of violations) as of mid-April, H Street &Pizza received an “F” for the accumulation of violations. At that time, InspectionMapper said, 25% of restaurants were rated “A”, 21% “B”, 22% “C”, 16% “D”, and 16% “F”. Neighbors say the infractions show that Salas has not demonstrated the attention to detail necessary to address their concerns. Apparently reflecting concern of the neighbors and underlining the need for a comprehensive approach to the rodent problem in the immediate area, Commissioner Ivan Frishberg told Salis that he expected a good “chunk” of his product would end up being consumed on 8th Street or in Metro Plaza. Salis agreed and acknowledged a systemic rat problem, but said that he can only control his space and his operation. In the end, ANC6B voted 8-0-2, to oppose the application, but added language addressed to the BZA acknowledging that the applicant has requested a delay and encouraging a delay in order to provide an opportunity for the issue to be resolved by negotiation between the restaurateur and neighbors and allowing ANC6B to consider the fast food exception and the variance at the same time. Those commissioners voting for the delay: Peish, Frishberg, Pate, Campbell, Garrison, Oldenburg, Opkins, and Loveland. 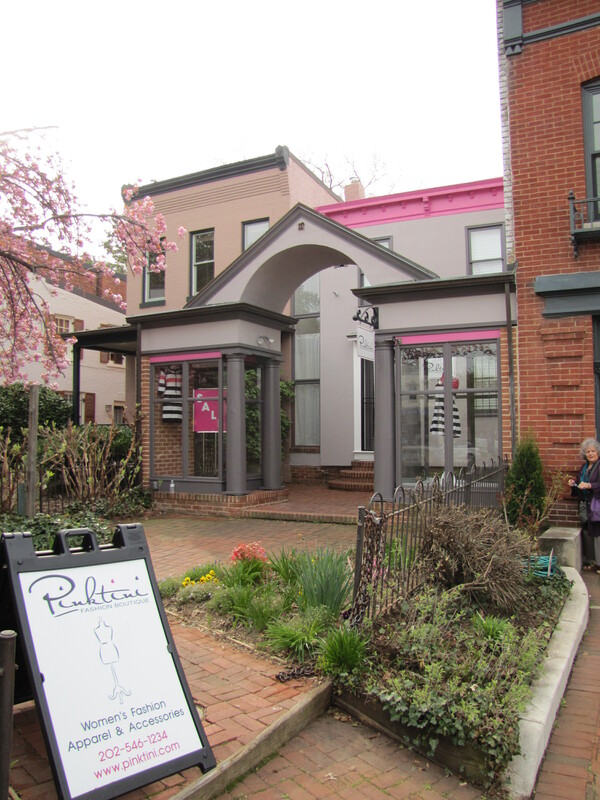 On the Eve of Potbelly’s Arrival on Barracks Row,​ Is Capitol Hill Losing It’s Character? 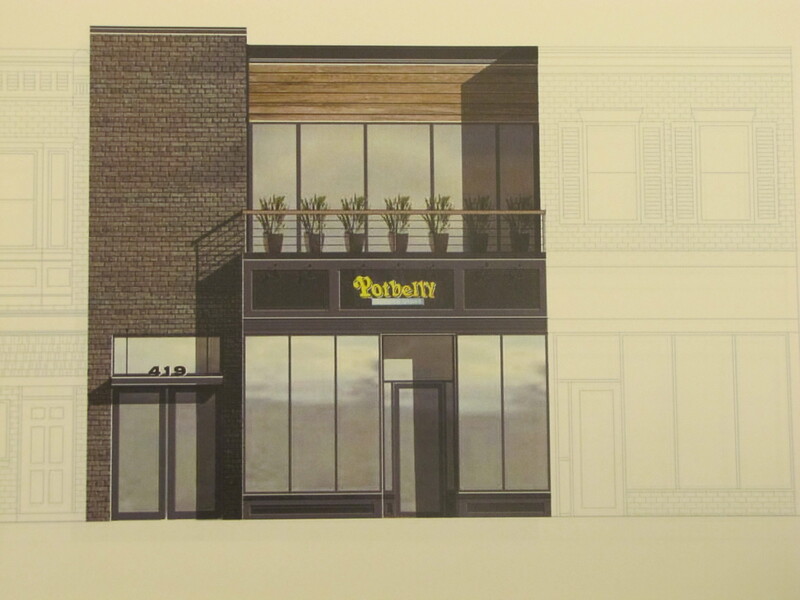 Some residents fear that homogeneity will accompany Potbelly’s arrival on Barracks Row. The restaurant is scheduled to move into the space formerly occupied by Tandoor Grill. Plans for the Indian restaurant to re-open on the newly constructed second floor have been shelved in favor of office space. Residents want more retail like Danna Oweida’s recently opened Pinktini Fashion Boutique, 705 North Carolina Avenue, in the former home of The Village Gallery, adjacent to Port City Java. 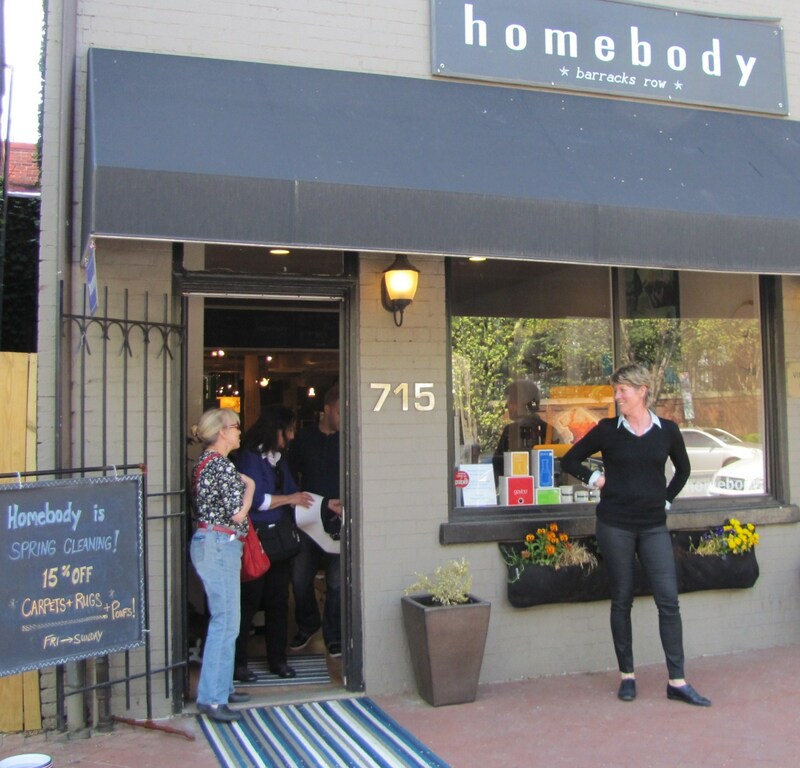 …and more like the deceptively named “Homebody” at 715 8th Street, SE, one of the coolest retail outlets on Barrack’s Row. Homebody, co-owned by Henriette Fourcade and Erin Mara is in its ninth year on 8th Street. 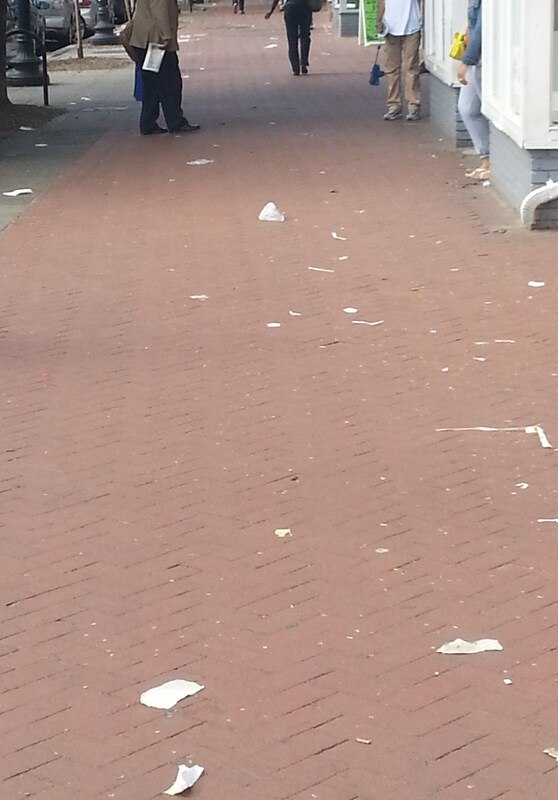 Mara interacts with customers outside the store on Saturday. Well, it’s a good bet that in the coming months Potbelly will move into the space now occupied by Tandoor Grille, and “& Pizza” will replace OXXO Cleaner’s on the same block. A series of recent changes in Capitol Hill business fixtures point to the state of flux in the neighborhood’s​ commercial corridors. The continuing trend toward food and drink venues – including fast food – worries residents. Gone: The old Hawk ‘n’ Dove, the 18th Amendment, Li’​l Pub, Remington’s, Fusion Grill, Hello Cupcake, Monkey’s Uncle, Capitol Hill Fitness, the Dollar Store, China Wall. On the way out: Tandoor Grill, OXXO, Capitol Hill Sporting Goods, Kraze Burgers. 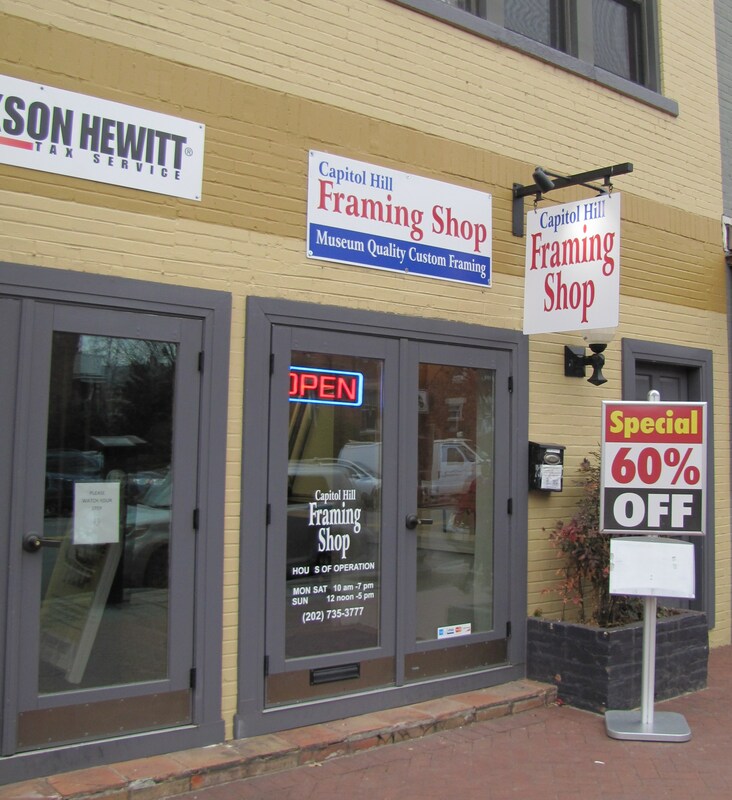 Recently arrived: Pinktini Fashion Boutique, Capitol Frames, Pure Barre. Barrel, Sona, Rose’s Luxury, Chiptole, District Taco, Medium Rare, Kimchii Cafe. The list above reflects changes in community demographics,​ ​as ​family​-​oriented businesses replace the edgier – and to some, more interesting – food and drink venues. As the edgier places turn over,​ landlords look to increase revenues by renting to food and drink providers. City agencies seem disposed to businesses which provide the most tax revenue. 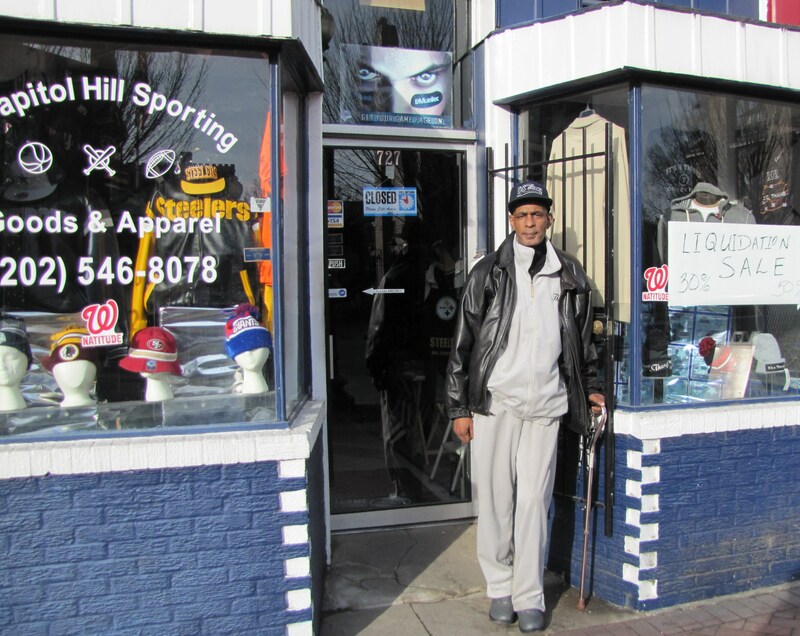 Rodney Smith of Capitol Hill Sporting Goods, who has until January before his lease is up, says the building’s owner has been approached by a sushi bar operator. One factor that contributes to high rent (and the bias in favor of chains that can afford them) is the major transportation hub at Eastern Market Metro. A high volume of foot traffic provides fertile ground for fast food outlets. Rents in the 400 block of 8th are reported to be $80 – $100 per square foot compared with $40 – $50 in the 700 block of 8th Street. 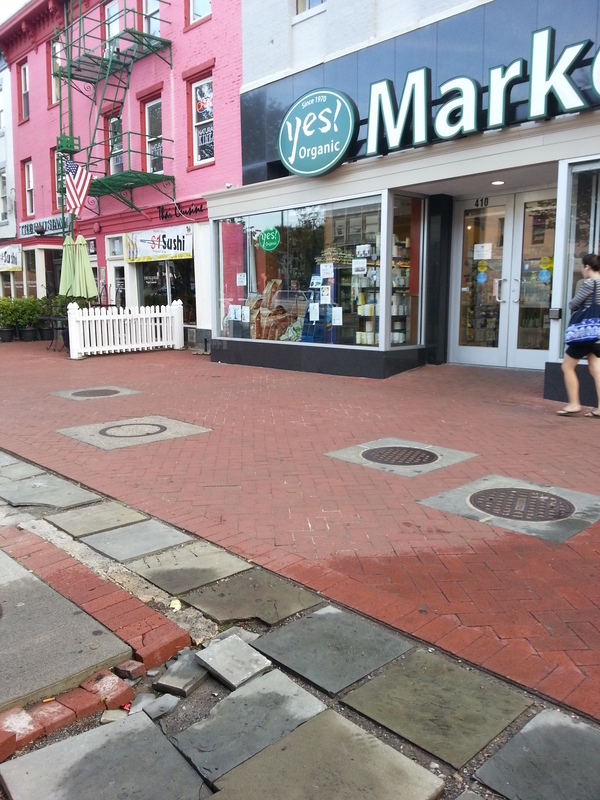 Residents and Barracks Row Main Street would like to see the street become home to more retail. 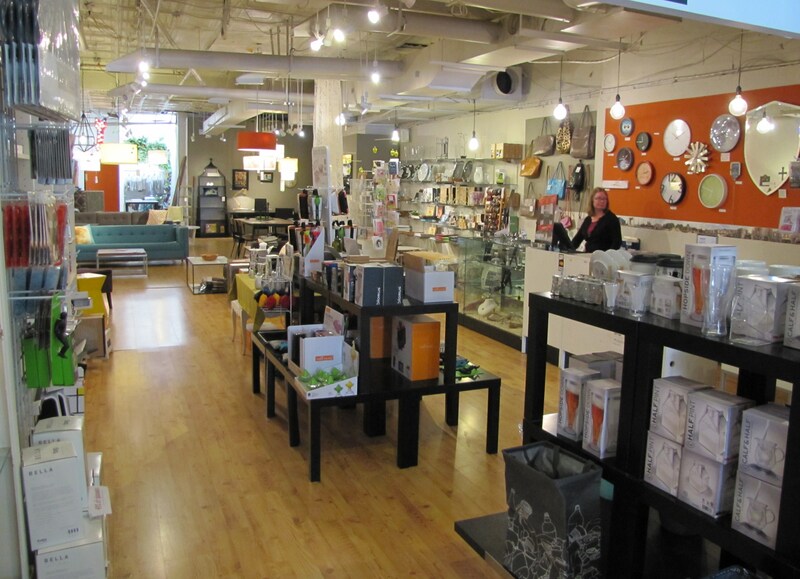 Five of the more successful Capitol Hill retail outlets are Homebody, Labyrinth Games and Puzzles, Hill’s Kitchen, Metro Mutts, and Biker Barre. 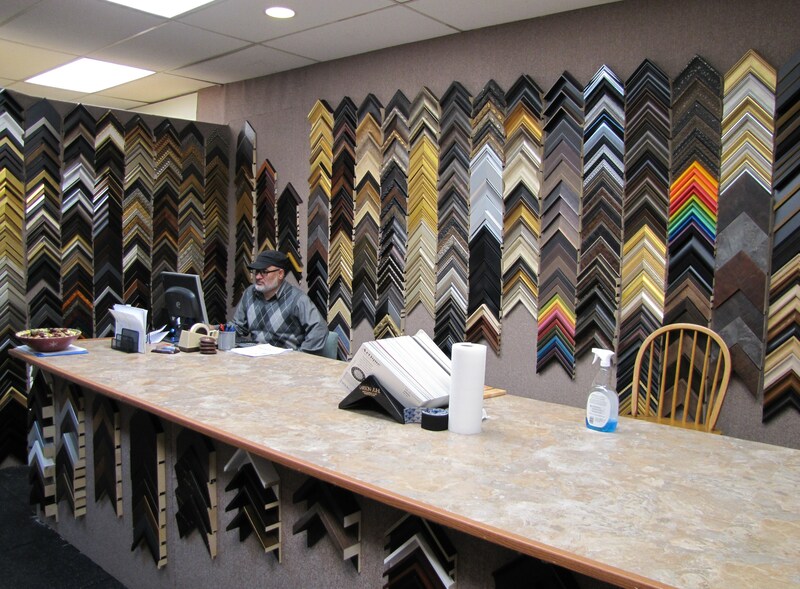 It’s noteworthy that owners of all five businesses live on Capitol Hill. Erin Mara, co-owner of Homebody,​ says that it helps to have a good landlord and says “sometimes, we don’t pay ourselves.” The Labyrinth Games & Puzzles and Howl to the Chief were recently listed as two of the 24 coolest small businesses in DC by Business Insider. http://read.bi/1ntYv7G Owner Kathleen Donahue of Labyrinth points to customer service and making your store a destination as the keys to retail success on Capitol Hill. Leah Daniels of Hill’s Kitchen says that engaging the community beyond the store by participating in community events, embracing the “unbelievable amount of work,” and framing your selection around customer interests and listening to their feedback is key to her store’s success. So too do policies favoring restaurants over retail – like those which allow restaurants to pay far below minimum wage and allow tips to compensate (and exceed) the difference. Visitors from Europe and Asia – including South Korea – must be surprised at the expectation of tips in American restaurants. It’s worth remembering that customers subsidize artificially low labor costs for restaurants and bars, which depend upon greater numbers of workers to function, but which can also rely on a high mark-up for alcohol to produce a higher net profit. And then there is the question of quality, and local versus chain. Some of the people who would pass by a Potbelly’s will try an affordable yet more interesting spot like H Street’s Toki Underground, Chupacabra, or Taste of Jamaica. Yet it is hard to design a policy tool that will facilitate one type of business over another. 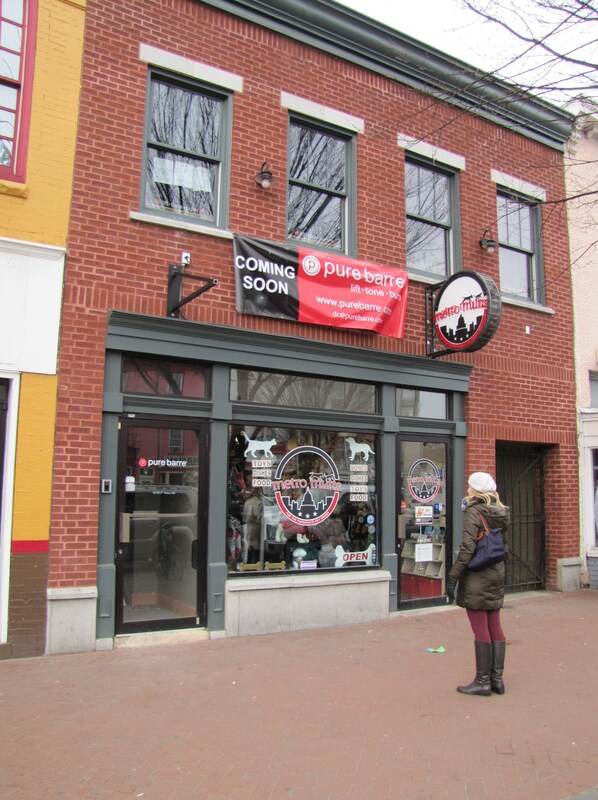 Likewise, the success of the locally owned Biker Barre exercise and fitness business on 7th Street probably factored in to the Pure Barre fitness chain’s decision to open an outlet over Metro Mutts on Barracks Row. It is difficult to see any threat to Biker Barre’s popularity as a result, especially since the fitness studio keeps its prices competitive. In light of the city’s hunger for revenue at the expense of integrity of the community, it’s up to residents to hold ANC6B and city agencies accountable to preserve the commercial diversity and unique character of our neighborhood. And in the end, it will be up to the neighbors to vote with their credit cards – in either direction. The lawyers did not say how the alleged deceit was effected, but according to court documents, the new owners fear the funds were diverted for other purposes. Cervera and his Florida-based partners sold their nine restaurants to a Boston investment firm in December of 2012. Cervera was brought in as consultant last August after revenues at the chain’s flagship restaurant – Hawk ‘n’ Dove – fell off sharply under the manager for the new owners, Richard Cervera (Xavier’s brother). Richard Cervera was removed as manager of the eight restaurants and Xavier Cervera was reported to have resumed control of the day to day operations of the restaurants on behalf of the new owners. (The ninth restaurant, Willie’s Brew and Que near National’s Ball Park, which was part of the deal, is still under construction.) Richard Cervera’s tenure as manager was marked by an effort to take the Hawk ‘n’ Dove to a new upscale level and a management style which reportedly alienated long time employees. Update: In response to the report, Xavier Cervera authorized the release of the following statement: “Xavier Cervera had no ownership, management, or financial control over any of the Debtor’s operations at any time following the sale. Any and all financial decisions and disbursements were those of the buyer, and Mr. Cervera never even had access to any of the buyer’s bank accounts or cash funds. One of those requests was to assist and advise the new owner in attempting to reverse a steady decline in sales and loss of key personnel that had occurred while the restaurants were under the control of Richard Cervera prior to Richard Cervera’s termination by the buyer last fall. Sales at the venues were increasing steadily after Richard Cervera’s departure and prior to the bankruptcy. All decisions as to management and financial control — and all aspects of the buyer’s finances and disbursements — were solely those of the buyer and any attempts to blame Mr. Cervera for the actions or inactions of the buyer’s management that led to the bankruptcy are without merit. This includes any payments made by the new owners with respect to the construction of their new restaurant – Willie’s – which was almost ready to open prior to the filing. In particular, Mr. Cervera has no “contractual obligation” to fund construction of Willie’s, as the new owners allege. Part of the purchase deal with Xavier Cervera was that he would not open a restaurant on Capitol Hill for ten years. But Xavier Cervera is planning a new gastropub in Shaw’s Blagden Alley close to the trendy restaurant, Rogue 24. The Wall Street Journal reported tonight about 7:30pm, that Barrack’s Row Entertainment filed for Chapter 11 protection in the U.S. Bankruptcy Court. The action also apparently protects Boxcar Tavern, The Chesapeake Room, Lola’s Barracks Bar & Grill, Molly Malone’s, Pacifico, Senart’s Oyster & Chop House, Park Tavern in Canal Park, and the soon to open Willie’s Brew and Que, on the Southeast Waterfront. According to the WSJ, Manager Richard Cervera signed the bankruptcy petition. 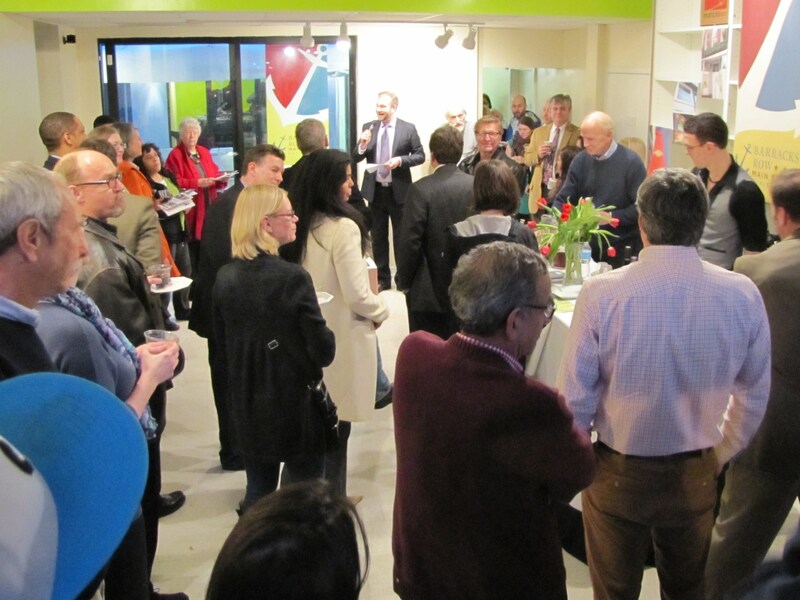 Last Wednesday, Barracks Row Main Street (BRMS) held its annual meeting celebration to highlight the 13 new businesses on 8th Street in 2013 and four new arrivals so far in 2014. 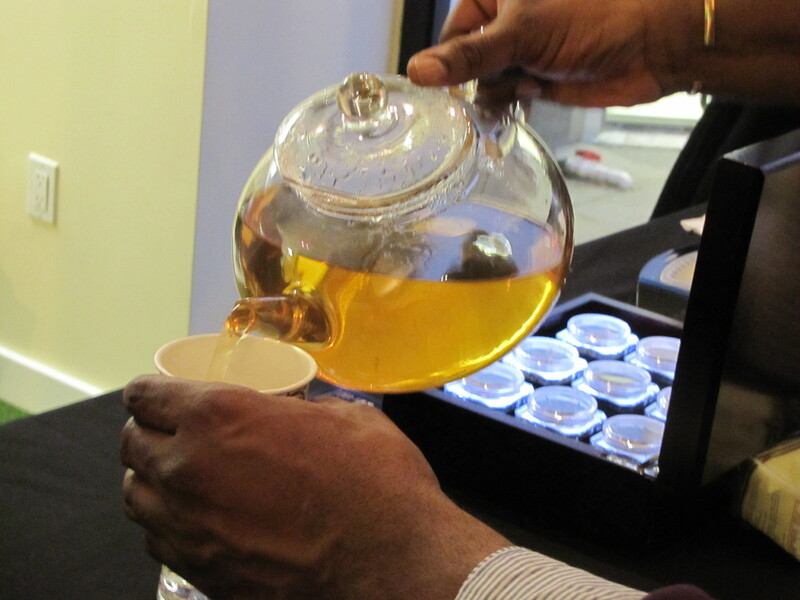 One of those new 2014 arrivals, the soon to open Capital Teas, at 731 8th Street, hosted the event. The majority of businesses which opened on Barracks Row in 2013 were food and beverage and service providers, including the restaurants Ambar, Kraze Burger, Nooshi, Tash, and Rose’s Luxury. Service providers included Capitol Hill Fitness (now defunct), Metropolitan Wellness Medical Marijuana Dispensary, Momentum Dance & Fitness, The Nails Spa, Optimus Website Design, and End to End Strategies. The oil industry environmental advocacy group, Oil Change International also set up shop on Barracks Row last year, as did the lone retail operation, DCanter, purveyor of artisan wines and craft beers from around the world. Martin Smith, Executive Director of BRMS also touted four early-2014 new business arrivals, including the prix fixe steak house Medium Rare and the vintage donut shop, District Donuts (opening soon in the former Sneed’s Barber Shop), Capitol Frame (formerly Capitol Hill Fitness), and lastly, Capitol Teas. 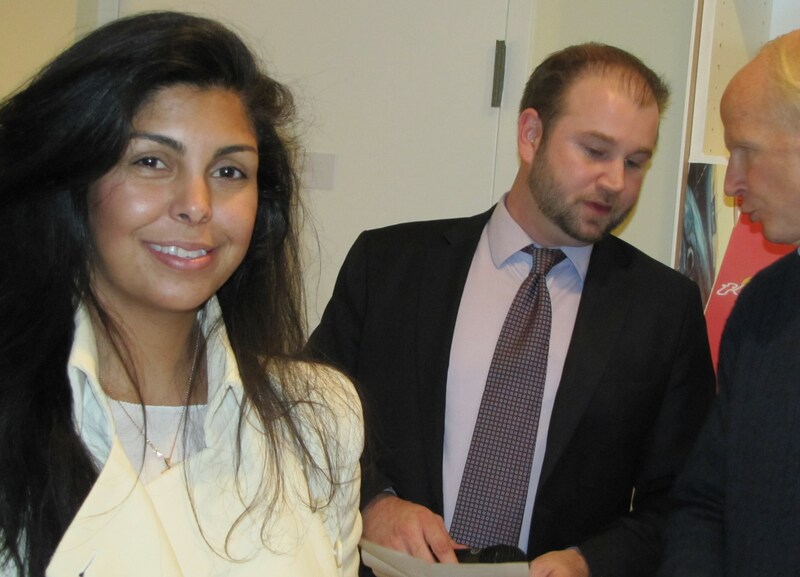 Manelle Martino, co-founder of Capital Teas. BRMS Martin Smith (center) confers with BRMS President David Perry in background. The BRMS board of directors is made up of representatives of business interests in the broader Capitol Hill retail corridors. According to Martin Smith, the board recently broadened its membership to bring in more retailers and property owners. 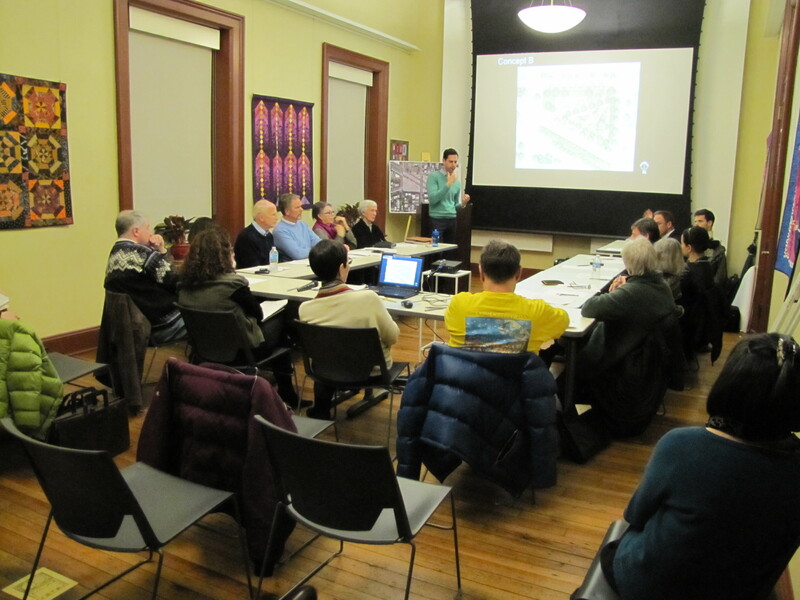 BRMS oversees efforts to recruit and retain small businesses, enhancement projects for public spaces, the Barracks Row façade improvement program, and a series of annual Barracks Row events. Day to day operations of BRMS depend upon contributions and support from the corporations, DC Government agencies, foundations, businesses interests, and the broader Capitol Hill community. For the second year in a row, the major cash and in kind donors contributing $10,000 or more included CSX Transportation, DC Department of Housing and Community Development, DC Department of Small & Local Business Development, and the National Capital Bank Foundation. Last Tuesday night at Hill Center, &pizza chain owner Steve Salis told ANC6B that he hopes to open a sixth location at 405 8th Street, SE, the current location of OXXO cleaners. 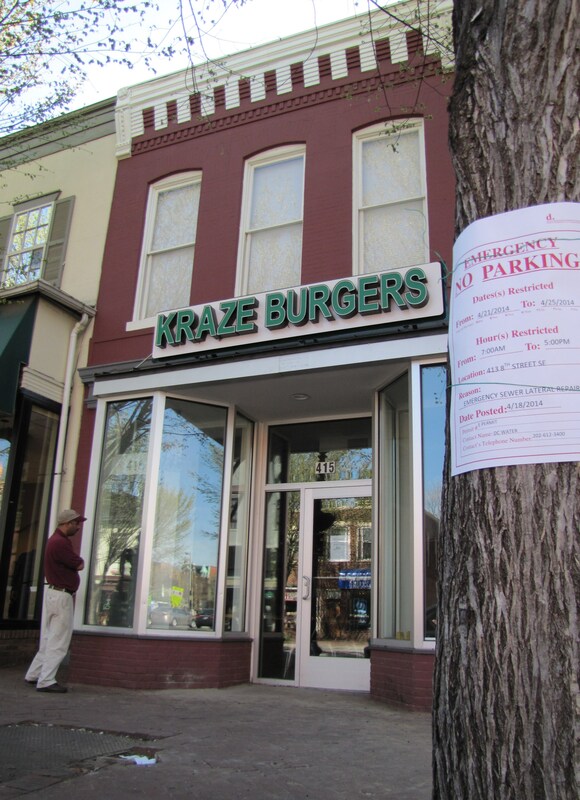 Veteran readers of Capitol Hill Corner will remember that Salis flirted with Barracks Row in 2011/2012, when he announced plans to open in the space at 415 8th Street, currently occupied by Chipotle/Kraze Burger. Salis is again reaching out to engage ANC6B, Barracks Row Main Street, and the community, saying he will apply for a fast food exception which will allow him to open up on Barracks Row. Barracks Row zoning requires a special exception for fast food restaurants. &pizza falls into the fast food category because you have to pay for the food in advance, even though inside seating will be provided. Zoning regulations provide some 15 or requirements an applicant must meet in order to qualify for an exception. The request will come before ANC6B, likely next summer and approval by that body will send the request to the Board of Zoning Adjustment for final approval. The issue is a sensitive one for nearby neighbors who have been vigilant in policing food venues on the 400 block of 8th Street because of operational issues contributing to rodent and odor problems. Salis said he is aware of these concerns and is prepared to address them. 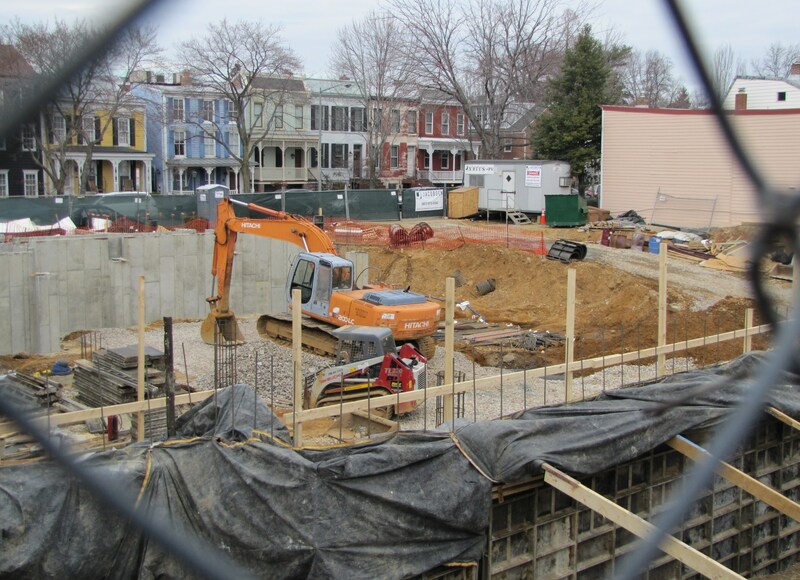 In February of 2012, Salis said he pulled the plug on the Barracks Row project after it became clear to him that he could not launch the business according to schedule in spring of that year. 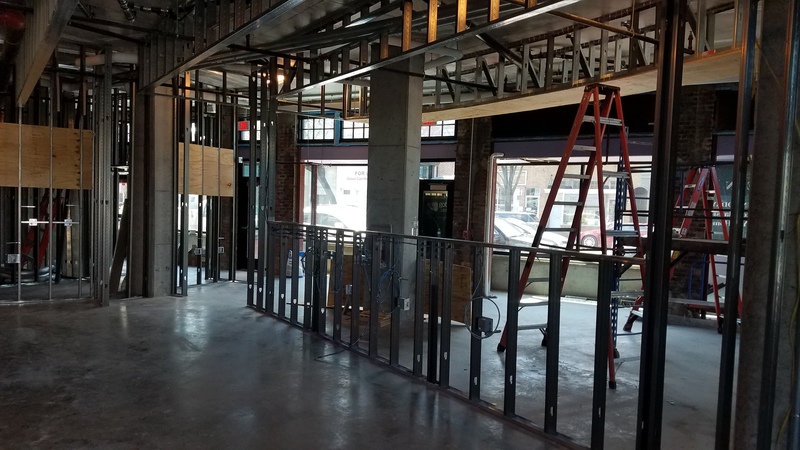 He cited the uncertainty involved in getting a fast food exception – even though the Capitol Hill Restoration Society had already signed off on it – and uncertainty as to when Streetsense could deliver the store space. In addition, Streetsense had asked Salis to “put down a substantial amount of capital as a deposit in order to hold the space.” He said he found his position untenable being faced with “a bad use of my capital and no guarantees” on how the process would be resolved.